Teenage Club has been cancelled on Wednesday 23rd of January! We regret to inform our members that Acctivate has been cancelled on Saturday 19th of January due to the weather conditions. Please contact Emma to book for our next session. The Raffle Draw took place at our monthly parent’s meeting on January 10th 2013, thankyou to everyone involved in organising and everyone who bought a ticket. The winners were drawn by our guest speaker Ross Littlewood, (pictured above), who gave an excellent presentation about living with Asperger’s Syndrome. 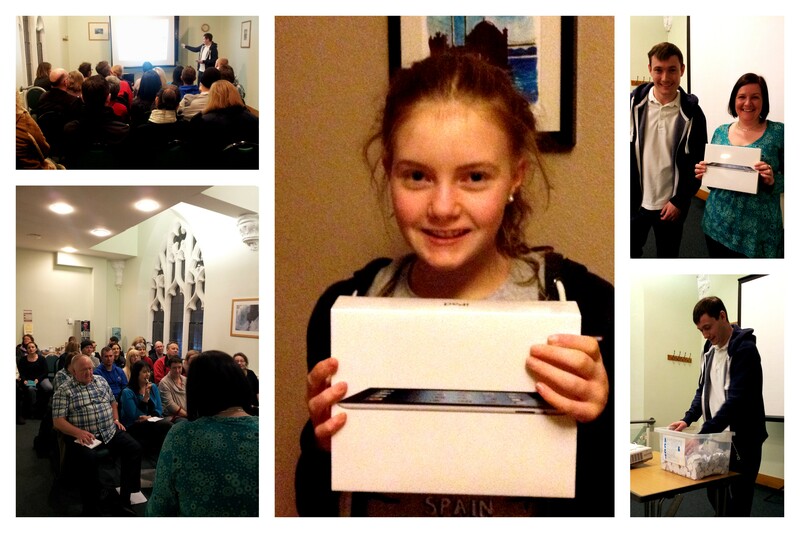 First prize, the Ipad was won by Charlotte Hampton (pictured above), daughter of Nicola Hough (pictured above with Ross Littlewood). Winners will be notified shortly or can contact the office directly. The total raised will be published next week. We now have an account set up on librarything, with all the books we have in the office listed. Parents can go online and look at all the books we have, then email or text Emma Shepherd (or Deborah Young for parents activities) and we can bring the book along to the next activity. All the books are tagged according to topic. Our next Parent Meeting is as at 7:30pm – 9.30pm in the conference room on the top floor of St Marys Community Centre, Bramall Lane, Sheffield S2 4QZ. Thursday 10th January 2013 – Ross Littlewood, a young man with Asperger’s Syndrome, will talk about his experience of growing up and living with AS. The winning tickets of the Christmas raffle will also be drawn. Can anyone with ticket stubs to hand in for the draw take them to the office before Thursday or bring them to the meeting. Thankyou for your support.